If you want to see the beautiful Ibiza beaches while traveling this gorgeous island, don’t miss any on this list. They’re all beautiful! Click here for more info. Ibiza is one of the most popular tourist destinations in the world, drawing millions of visitors every year. Many of them set out to have the party of a lifetime at clubs like Nobu and Amnesia. However, there’s more to Ibiza than cocktails and DJ sets. There are lots of beautiful Ibiza beaches, too. In this post, we’ll give you the rundown on the best ones. 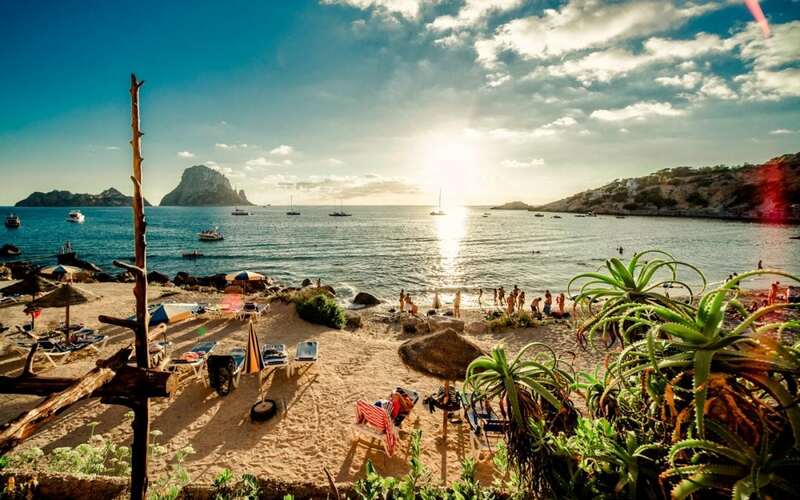 If you’re heading to Ibiza, these beaches should be on your list of places to visit. As well as being one of the best beaches in Ibiza, Cala Llonga is also one of the biggest. Dotted along the shore are lots of different restaurants and clubs, so you’re never short of something to do. If you’re looking for a relaxed safe haven and a place to get away from it all, this little gem is perfect for you. Sol D’en Serra is a small, secluded beach near Cala Llonga. It’s only 300 meters long and 5 meters wide, so it offers a great opportunity for some quiet time. The access path to the beach is concealed, but if you follow the road from Cala Llonga, you’ll find it. When you arrive, you’ll be blown away by the views. There’s a stip of smooth pebbles contrasting the shimmering turquoise sea, leading up to the soft sand for you to sunbathe on. Due to its small size, it’s no surprise that this beach has only one restaurant. However, it’s so good that it’s often what draws people to the area. Restaurant Amante offers great parties, as well as morning yoga sessions for fitness enthusiasts and an outdoor cinema for chilled evenings. Just a ten-minute drive from Ibiza town is the beautiful Las Salinas beach. This beach is very popular and gets very busy in high season, so if you’re looking for some peace and quiet, this isn’t the best option. However, if you want to be right where the action is and see some of the best that the island has to offer, pay Las Salinas a visit. You’ll be spoiled for choice when it comes to bars and restaurants, and can have your food and cocktails served to you right on the beach. Beach merchants and ticket sellers are frequently passing through, so you’ll be able to do some shopping and plan your evening activities, too. This beach is also great for adventure seekers. There are plenty of opportunities to play water sports, and if you take a stroll, you’ll find yourself in the Ses Salines Natural Wildlife Reserve. For something a little different, try Sa Caleta. Here, a crescent of sand is surrounded by red cliffs. The water is shallow, so you can walk out far into the sea. This makes it ideal for families with small children. If you’re trying to party like a celebrity in Ibiza, Cala Talamanca should be your first port of call. It’s within walking distance of Pacha, one of the best and most famous nightclubs on the island. There are plenty of other beach bars, clubs, restaurants and hotels in the area, too. The beach is curved with soft sand leading all the way down to the clear blue water. This means you don’t have to worry about stepping on any rocks or pebbles when you’re heading for a swim. While you’re there, you can keep yourself busy with pedalos, jet skis, volleyball, banana boats, or even some scuba diving. If none of those appeals to you, you can always just sit back, relax and enjoy the beautiful view. Es Niu Blau is a 100-meter stretch of beach between Santa Eulalia and Es Can?. Here, the water is clear and the sand is lined with pine trees, creating a lush green backdrop. When you’re done swimming and sunbathing, you can take a nice coastal stroll to enjoy the rest of the area. While this beach is smaller and quieter than many of the others on the island, it still offers plenty of amenities. You can rent parasols and sunbeds and get food and drinks from nearby restaurants and bars. Cala Pada has some of the clearest, bluest water Ibiza has to offer. The sea here is almost transparent, which makes it great for snorkeling and swimming. The sand is light-colored and very fine, providing a soft cushion underfoot as well as an Instagrammable view. As you walk down to the ocean, you’ll feel the layered shelves of sand descending deeper into the water. If you want to get out of the sun, you can escape to three different restaurants, which each has its own shady terrace for some light relief and refreshment. In the North of Ibiza is Puerto de San Miguel, a tiny resort with its own beach. Even if you’re not staying at the resort, it’s worth making the trip just to check out this beach for a day. Crystal clear waters are surrounded by steep cliffs and large rocks, and pine trees fringe the area. Take a walk along the cliffs or visit the nearby dripstone caves to make a day of it. Cala San Vicente is another beautiful beach in the North. Here, you can enjoy almost 400 meters of golden sand, curved along the shoreline. Behind the beach, there’s a quiet promenade, which has some charming little cafes for you to enjoy. To make the most of it, head to the clifftop viewpoint and look out over the ocean. Cala Jondal is an Ibiza town beach, which is popular with boat owners. It’s one of the more up-market offerings on the island and is frequented by a stylish crowd, who visit for the pricey clubs and restaurants. The beach is pebbly but has a strip of soft sand for sunbathing. Look around, and you’ll see rocky cliffs and hills, decorated with palm trees. Now that you know which Ibiza beaches to go to, the next step is to plan your vacation. As well as buying your tickets and booking your hotel, you’ll have to plan out an itinerary. Do some research on restaurants, weather, excursions and transport in Ibiza before you go. To make sure you don’t forget anything, take a look at our ultimate vacation checklist.